Retreat, relax, and refresh in a spa-inspired bath design that helps alleviate the daily stresses. Influenced by Far East design, the clean-lined PALOS VERDES faucet by California Faucets adds a soothing, meditative state to your bath. The PALOS VERDES’ widespread lever handles create visual balance as the silhouetted water steam flows from the angled, tubular spout. Decorative round bases that give geometric symmetry to spout and handles punctuate the elegantly crafted faucet. PALOS VERDES’s soothing style is designed to wash away the day’s weariness while infusing the bath with purity. Design flexibility is another refreshing asset of the PALOS VERDES faucet. 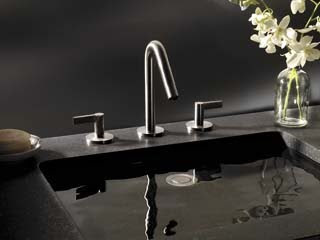 Choose the design in Polished Chrome (shown), Satin Nickel or in any one of California Faucets’ 30 decorative finishes. As with all standard California Faucets designs, the PALOS VERDES spout can be mixed and matched with handles from other series to change the look. Together with California Faucets’ flexible and complete line of customized options, the PALOS VERDES elevates your bath’s style while transforming it into your own personal home spa. Complement your PALOS VERDES faucet with a coordinating tub and shower set or choose an oversized and modern rain showerhead. Then create congruent and stylish flow with decorative and functional finishing-touch bath accessories, from decorative hardware, soap dishes, and towel bars to StyleDrain™, the first decorative shower drain with fast-flow efficiency, a patent pending design exclusive to California Faucets. List price for the 8' widespread PALOS VERDES faucet with lever handles in Polished Chrome is $425. In a Special Finish, such as Satin Nickel, the list is $574. And for Premium Finishes, from Black Nickel (PVD) to 24K Polished Gold, the list is $680. California Faucets has been providing its customers with the very best customer service and delivery of the finest selection of decorative fittings in the industry since 1988. With over 25 styles and more than 30 decorative finishes, California Faucets’ Custom Faucetry® allows you to combine any spout with any handle in any finish. California Faucets over $99 ship free from eFaucets.com, the online faucet leader.